This isn’t your grandpa’s cabin. Cabins are no longer a shack in the woods, they are a lifestyle. 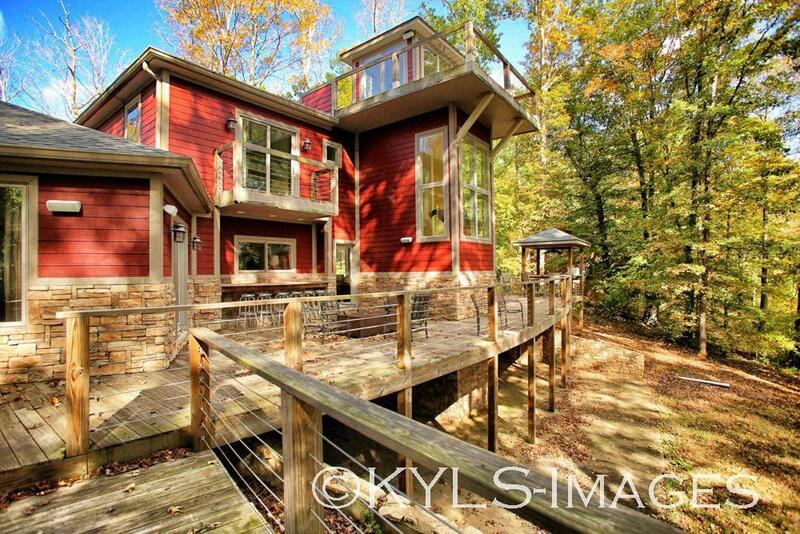 Welcome to the new Cabin Culture with this wooded property. It’s huge – and has everything – Fireplace, bar, firepit, hot tub, BBQ, Views, woods, etc… Cabin on Lake Cumberland sleeps 20, FP, Outdoor Bar, Firepit – Family use or Rental Income – or both. Lake Cumberland House Kentucky Lake house for sale. You know how I am about family – well this family home is special – and it also has super rental history – and income. This home also sleeps 20 people in beds – bring your whole crew — yes, you can even bring that weird brother in law – the house is so big, you can dodge him when you see him coming! I can’t say enough good about this 5 bedroom, 4.5 bath Lake Cumberland House Kentucky Lake house. It sits on almost an acre on Lake Cumberland – set in a cove with a view of the Marina in the distance. SUPER convenient location 10 minutes to I-66 – Cumberland Parkway. 70 minutes to I-75. I promised the seller I would sell it for them. The sellers are asking $400k – and the rental income covers the mortgage, so call me to come see it, Ken 859-494-5521 and thank you for helping me sell it for these folks by sharing this with family and friends. VIDEO coming — hold tight – we’ll have them hopefully the beginning of next week! I’m excited too. Kentucky Homes and Land for sale. You know I always want to show you cool places, this is another cool Kentucky Lake house for sale place. This is a lake house down here on Lake Cumberland, which is amazing, 64,000 acres, but I want to tell you where you’re at first of all. If you go out this way and come down 127 or come up the Cumberland Parkway, it’s the corner127 which is a big road and the Cumberland Parkway which is part of the I-66 thing, I don’t know if that ever was completed or whatever, but that’s part of Interstate-66, at seven miles that way in a little town called Russell Springs, cute little place and it’s close to a lot of things, and of course it’s all about the lake economy here. So you turn there, seven miles down the nice road and then you just turn right in here, it’s just, I’d don’t know, a couple hundred feet up there and you are at …there’s Captain’s Point and you’re right on Lake Cumberland which is 64,000 acres, a hundred and 20 miles long, over 12 hundred miles of shore line because it goes and wiggles and wiggles, all these little coves, 12 hundred miles. So you’ve got the beautiful gates here and you’ve got, this is all stamped concrete so it looks like Belgian blocks, and then this part here, this is such a nice design, everything’s nice here, this is like a cut-stone or shale or something like that, those concrete will be here a long long time. Check this out, isn’t that beautiful? This is all stone. Someone was saying to me just the other day, they said “Wow! That property looks really beautiful, why is it so beautiful?” I say “Well first of all, it’s underground electric, that helps…” and this property has got the exact same thing, so everything’s underground here, you’ve got all pad transformers, look at this, so you know there’s not going to be any unsightly wires or poles or any of that. And this is just the most glorious Fall day, I just love the Fall, it smells good, it sounds good, you got all the rustling leaves, it feels good, it just feels right. So wanted to show you this entry…oh here, let me show you up here first…this right here is some of the land that’s available for future development, and now a lot of these lots are sold and people are waiting to build on them or on speculation, or whatever, but is just a loop here that just goes around, it’s not a big…not a big loop so there’s not that many lots in here, but the land is just beautiful. Isn’t that fountain just gorgeous? And then you’ve got this stone wall, and you’ve got roses and then these are all big healthy Craig Myrtles, so you can imagine what that’s going to look like in the Spring and Summer. I’m going to show you this whole property but I just want to marvel in the Fall, it’s just spectacular, and oh… tell me if I’m hitting the mark on the properties you want to see, put it in the comments below, and I always tell you to sign up for our Exclusive Buyer’s List at end, but I want to tell you here at the beginning so you don’t forget. Click on this box right here and sign up for our Exclusive Buyer’s List, you’ll be alerted to properties two to three days before it goes to the general public or it goes on the MLS, so you really have an advantage and an opportunity to come out and see the properties with our agents, sooner than anyone else. Anyway, click on the box right there and it’ll take you right there and you needn’t go back through the video, but comment below, say if we’re hitting the mark with the kind of properties you want to see. I was watching one of my videos the other day and I thought my sound was bad, something was bad with my sound, but it’s the rustling of the leaves, it’s the beautiful time of year when the leaves start dropping and they are making a lot of noise, course we’re out in the woods too so it’s actually nature doing its thing. Lake Cumberland House for sale. Hey we’re at Captain’s Point here a Kentucky Lake house, you saw the gate, you saw the entrance, I call this house the ‘house of dreams and possibilities’, now this is right on Lake Cumberland, 64,000 acres, it’s Army Corps of Engineers, and when I say dreams and possibilities, this is the place where you say “Oh my gosh I’ve got to bring my family out here and we can dream about the future, we can talk about the possibilities which are endless.” Someone who’s going to buy this property is going to be the person who understands exactly what I’m talking about, dreams and possibilities, and this is it, I tell you, you buy this property, you’re going to feel like you’ve made it, I know I certainly would. About 37 hundred square feet at an unbelievable price, you can’t build this house for a hundred dollars a square foot more or less, and that’s about what they’re asking for it. Absolutely beautiful, stunning views, and it’s a stunning property, wait til you see it. Let me just point out a couple of architectural features while we’re here, we’ve got a belvedere up there, or a tower, it’s a square tower with all glass…let me see if I can get over here and see it any better. You’ve got the cultured stone going up with a beautiful fireplace inside, wait til you see all the stuff. It’s got hardy plank on the outside which you know is that concrete fiberboard so that’s a really big plus and you’ve got tons of bedrooms, this property sleeps about 16, so if you’ve got a big family, rock on; if you got business associates, rock on and bring them…or if you’ve kids like my kids, they’ve got a dozen friends each, they can all come on up and go crazy. You’re a mile from the marina, I’ll show it to you over there, and you’ve got the barbecue grill area out here, you’ve got a hot tub, you got multi-level decks, et cetera, et cetera, come on. So here’s the driveway, come up, I parked my car in the side there so we got more room. This is one of those properties that really has, I don’t want to say two sides, it’s got three sides, the architecture here is absolutely beautiful, the other side you can see the tower, and this is the side you’re going to come up to to park your cars and enter the property. You’re right on Lake Cumberland as I mentioned but there is an Army Corps of Engineer buffer zone, you’re on the buffer zone so there’ll never be any building in front of you and you can walk right on down to the lake though they got a couple canoes down there, but again, you’re just a mile from the…from the marina. But what can I tell you about this, I mean you can see if you’re a person looking at this property you can already see what’s going on. It was obviously designed by an architect, laid out nice, I mean the design is very nice, a lot of square windows, a lot of glass obviously, why wouldn’t you have a lot of glass? I’m going to go in this way, I actually should have used the walkway but since there’s leaves here…many walks are available on Lake Cumberland, not very many. First thing you’re going to notice is the maple floors, absolutely stunning, and they’re everywhere, you’re going to love that. So this great room really is great, no pun intended, real high ceilings, views of the lake everywhere, in fact I don’t have the right lens on here but you can see the lake, beautiful, it’s enough cause it gives you tons of privacy coming back, so that’s kind of important, everyone wants the view but then they want the privacy and you don’t want to eliminate that. That’s a regular wood fireplace by the way, what we like to call a “masonry fireplace” but it is a regular wood fireplace. This dining room, is this unbelievable right… two, four, eight, ten seat…the table seats 10. Kitchen’s really nice…chique, you’ve got these very cool pendant lights which are MR16s, low-voltage, and then you’ve got these sleek handles and smooth front here, it’s very nice…and this is solid surface…soft close, very nice. So who’s going to use this? Absolutely anyone who lives in central Kentucky which we call the ‘Kentucky Crossroads”, anywhere in the Bluegrass State, someone from Ohio perhaps might want to use this as a weekend place, the important part is there is an income on this property, you can rent it out for the weekend, ask me how I know? Just got done talking to the owners and that’s what they do, they got transferred and are moving on but they have huge rental income on this property because…because of the lake and because it sleeps so many, so you have great income here, so rent it out, rent it out and just pencil out the weekends if you want it and you’ve got a positive cash-flow property here. Okay, got a nice sized laundry room in here, and here’s what I would use it for, I would use it for a pantry,which is what they’ve started to do here, they use it a lot themselves for the whole family so it’s kind of stocked that way, there’s nothing in the refrigerator, that sort of thing. If you walk in, here you’ve got the garage doors and you walk right in …. you’ve got the … fixtures, look at that, so nice, it’s Halloween they got the eyeballs so. This is what I consider the master so you got beautiful like a Spanish porcelain tile on the floor and in the shower, this is really cool…so this is big enough for several of your friends depending on what kind of parties you have. That was a joke, it’s a joke…it’s just a joke, and …but it’s big, it really is, if two of you need a shower at the same time. I’m not judging, I’m not saying nothing, but you got plenty of room in here for that, again … fixture. This is a nice touch, big closet…well taken care of house. So the view here, it’s all about the views right…and this goes right on out to hot tub and all …screen here, so you can open these generous windows, those truly are monsters…casement windows and you’re out to all the sounds of nature, there’s rustling leaves, there’s squirrels running around, there’s acorns everywhere, if you’re a squirrel you’ll want to…you’ll want to be here cause its unlimited food supply, there are tons of acorns because there’s tons of oak trees, I mean all kinds of oak trees here, and again, more views of the lake. If you’ve been following my videos for very long you know I can be a little corny and a little bit sentimental, maybe it’s because I listen to too much Michael Boulais and drink too much red wine but can you imagine sitting here with your family, your kids and your grandkids talking about life, talking about the possibilities of building a legacy, talking about the possibilities of their potential, that’s what I mean about this property, it’s dreams and possibilities. This property was built by one person with one idea obviously it was a couple or a family or something of the type, but you get the idea, this was not…this house was not built by some big corporation, this is one couple with a similar goal, similar ideas, similar dreams, and they were able to share all those same things with their kids, all the possibilities of life. Alright let’s go on upstairs. More architectural stuff, you got the pendant lights which is kind of cool like the perfect spot for those here. See what you got going on over here…you got a beautiful rail and this overlooking the great room. This opens up to twins…two twins here, lots and lots of natural light and tons of privacy, so you can imagine if you’re down here, no one going to look in at you except the squirrels, have what I consider a Hollywood or a Jack-and-Jill bath here, you got two sinks, a shower and a hopper…there’s the hopper room and then beautiful one piece. This is a very nice bedroom up here, good size, it’s got its own deck, so this would definitely be a guest of honor up here right, certainly not going to put your son-in-law up here…just joking, just joking, I’m a son-in-law too. Let’s go on outside. Okay so here’s where we came up…pretty, lots of light, look at that beautiful natural light, isn’t that just spectacular? And then there is a ladder, like a ship’s ladder that goes up to the tower. Let’s go on up. Okay we just climbed that ladder and I just wanted to show you what the tower looks like, so it’s glass all the way around, there’s the lake of course. This looks down, course the deck outside too looks down over the barbecue area but it’s all glass up here, pretty neat huh? Go out here and walk around… there’s the road and the driveway, in fact there’s my car…and there’s the barbecue area. You’re on top of the world here, I guarantee you that’s easy 30 plus feet down there. And there’s the lake, there’s a view of the lake, wow! Look at that, you can see the marina…yeah you can see the marina from here, sure can. And then this is the hot tub, master bedroom and then into the kitchen, et cetera. Anyway that’s what the tower looks like, beautiful, love that color, there’s so much green up here with the trees…and there’s the lake, and there’s the marina. Can you see that? I think if you’re full screen on your computer you can see the marina’s right there. A little firepot there, hammock and of course hot tub, needs a new lid, no big deal, we get a new cover for ours about every three years or so, it just happens to be its time. Okay, come down the ladder and then go back down…we get call after call after call, people want to be where they have the woods, “We want to be in the woods… we want 10 acres in the woods…we want five acres in the woods.” “What are you going to do with all?” “I don’t know, I just want privacy and we want to build a cabin.” Well here’s your cabin, you got all the privacy in the world cause you got Army Corps as your neighbor here, and the lake which is down…I don’t know, 50 feet from here of the lake level? And the 65 or 64,000 acre lake with 12 hundred, believe it or not, 12 hundred miles of shoreline cause it does a lot of these coves, and this happens to be a cove right in here. So 12 hundred miles of shore line, all the privacy you need on just under an acre, about nine tenths or so. Alright, so this is almost like a stair tower, in fact…and then of course the tower’s above this, so maybe it is a belvedere, but it’s a stair tower, pretty cool. Let’s go on downstairs. We’ll see the downstairs which is pretty crazy because this is the fun room, this is the kids’ room or sons-in-law, you put all the sons-in-law down here right. So you’ve got these two big doors down here that go out to this huge sheltered area and it’s all…all been stoned so I’m assuming it’s poured, it’s all been stoned. Check this out, let’s count them together, one, two, three, four, five, six…guess what we got six on the other side too. So you can fit 12 kids down here, maybe one on the coach, 13 kids here…oh my gosh, isn’t that crazy, and…oh, here’s the cool thing, it’s boys and girls. So you put six boys on this side and another big big shower with beautiful tile…you put six boys on this side, oh my gosh! Bring your aspirin and your ear plugs because you know it’s going to be a wild time. And then let me show you over here… and then six girls over here, good…my goodness, oh my gosh, can you imagine the screaming and the hollering here? Lifetime memories, that’s all it is, you’re just building lifetime memories…dreams and possibilities. And we’re back up here on the main floor, isn’t this light glorious, can you imagine the fireplace going? Smell of pizzas in the oven…got a big double oven there…and then of course this is really what this property is all about…you got a bar here, you got what? 12 or 13 kids downstairs then let’s count real quick, a couple here in the master suite, so that’s 15, then you’ve got the nice suite up here, that’s 17, the twin beds in the back, that’s 19, so you can really…you can comfortably have 19 people here, oh my gosh! So you’re going to spend a ton of time outside, you’re going to have people here, there, everywhere…you’re going to have auntie and gram, they’re going to be on the coach, and then…and then the guys are going to be cooking over on the barbecue and then the gals are going to be chatting here over a bottle of white wine right, you can see the whole thing, oh my gosh, and then of course you’re going to people down at the lake fishing as well. I’m going to put down here the distances from like Cincinnati, from Lexington, from Louisville, from Knoxville, that sort of thing, this is just a nice easy commute, leave work a little early on Friday…by the way I wanted to point out, these are 14 Sears and there’s three of them, there’s two one size and one the bigger size, but that’s some serious horsepower right there. There’s speakers everywhere on the outside there are speakers all on the inside, there’s another one over there. So dreams and possibilities. So I’m already thinking about this, seeing how I could manage a place like this or this place, you know you leave on Friday what, 2:00/3:00 o’clock in the afternoon and grab the kids right from school and you shoot on down here, you’re here by what? 5:00…and by the way, this is in Central Time Zone, you’re basically going straight down but you know how the time zones go like that, this is in Central Time Zone, so you’re not in Eastern and you actually gain an hour when you come down, so you’re here by 5:00 at least, no problem and you can get all your stuff settled in what? Half hour, 40 minutes, and then you start the grill, start a little fire down here. And you talk about getting about from it, so now you are 6:00 o’clock on Friday til as late as you can squeeze it on Sunday. We just took a trip together, it was a cruise which was wonderful, cruises are great, they’re a little schmaltzy but they’re really great because you don’t have any of that electronic stuff, unfortunately you’ve got really good cell service here, but…so the kids…you just have to tell them they have no cell service and leave their electronics at the door, but this is lifetime memories, a place like this, lifetime memories are made here. And this is the living room you remember…it is the most beautiful Fall day I remember in a long time, and I get suspended showing you some of my favorite properties, this is one of them. So this is where the…this is where the barbecue lords are…dad with his almight spatula and apron and the uncles and all that sort of thing hanging out here with the boys and having a beer, burning some burgers…or burning some kind of meat I can assure you, but it’s going to get burned, you know how that goes right…and then this huge fireplace. This is what I have for you today, the lake house down here on Captain’s Point, lake house of dreams and possibilities, just under an acre, it’s ready to move in, you could not build this house for the asking price, so about a hundred dollars a square foot, you got about 37 hundred finished square feet, and that includes the basement. Could you see yourself here with your family? Could you see yourself making lifetime memories with your kids or your grandkids? This is the place and the income, so don’t forget about the rental income, you can rent this out and make the payments or if you pay cash or put something down you would have a positive cash flow, and that’s already set up, remember I told you these people, that’s what they do, so it’s already set up, I’m sure they’d be glad to share with you the people who help, who turn the place, they clean and they reset all the bed linens and clean those and so on and so forth, so I’m sure they’ll be glad to share all that information with you, that will go along with the property…who’s going to mow the grass? Who’s going to put the wood here and all set up like a bed and breakfast type of situation. But there’s a big market for that, a big market for that here on Lake Cumberland. Thanks for watching this video on a Lake Cumberland House – Kentucky Lake house for sale, if you like what’s going on, first of all call Ken here, come on down, take a look at this property, just take a look at it and you’ll fall in love with the view and the serenity and the time you can spend with your family, that’s invaluable, so call Ken here, and if you like to look at properties don’t forget to subscribe. Click on this box right here and you will be on our Exclusive Buyers’ List which means you’ll get properties two three days ahead of the general public and the Multiple Listing Service, that is so super cool cause you’ll know about this property before anyone else does and you can come in here and take it off the market and come in and look at it before anyone else does, so you can beat all the other realtors here too. So anyway fill up that box. Talk to you soon. Thank you and thanks for watching this Kentucky Home and Land for sale.